Fourteen years ago today, five young boys in their early teens stood on a boat in Hawaii to introduce themselves to the world. One said they want to create a storm around the world, something that was obviously a play on the name that was chosen for them. In their young, uncertain minds, I’m sure never for once did it occur to them that those words will be prophetic. As one of them would always ask at the end of their awesome concerts: “namae nandesuka?” Their name: ARASHI. 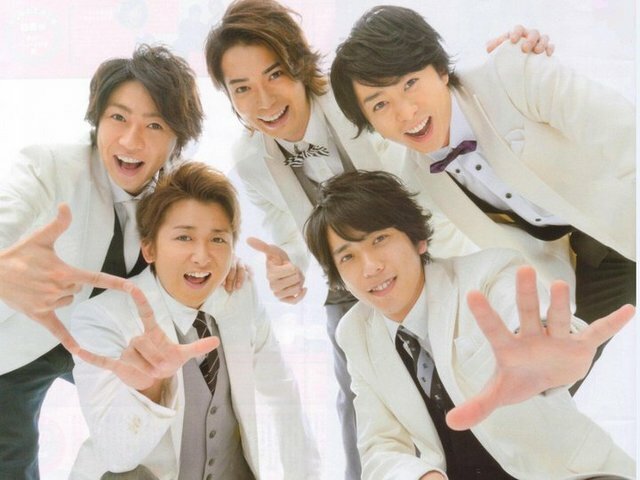 And in celebration of their 14 years, I’m listing 14 of the defining moments in the collective life of these five boys who are now full-grown men: Ohno Satoshi (32), Sakurai Sho (31), Aiba Masaki (30), Kazunari Ninomiya (30) and Matsumoto Jun (30). 1. Their debut aboard a cruise ship in Hawaii on Sept 15, 1999. Who knew that they chose Hawaii because Higayashi-senpai hasn’t been there? 2. More than half a million in sales for their first single A-Ra-Shi, and almost a million by the end of its chart run on Oricon. 3. C, D, G NO ARASHI. These are the shows that shaped the young Arashi, made their faces thick shameless made them game to do anything including ridiculous stuffs that idols are unheard of doing, honed their hosting skills and planted their feet firmly on the ground. I am so grateful that they started out this way because it made them work harder and sweetened their success even more, made them humble and appreciate the fruits of their labor, without taking for granted the fame that came with it. 4. HANA YORI DANGO. This drama was not only Matsumoto Jun’s breakthrough, it was for the whole group. How many have been Jun-baited and eventually introduced into the rainbow-colored world of Arashi? It could have been any other drama, but in Arashi’s history, it was this drama that threw the doors wide open for them. 5. The Moving Stage. Jun’s brainchild became a fixture not only in Arashi’s concerts but in other concerts as well, including, ehem, K-pop. FYI, Arashi has been using this since 2005. 6. NEWS ZERO. Again, even if this is Sakurai Sho’s solo work as a newscaster (creating history of being the first idol to branch out into the more serious side of TV), it also reflects on Arashi and gives them added credibility in the industry. I can only imagine how many of those watching Monday night’s late newscasts have been Sho-baited into Arashi. 7. LETTERS FROM IWO JIMA. Same case as #s 4 and 6. This Clint Eastwood film marked the Hollywood debut of Ninomiya Kazunari. What amazed me over this was, Nino was not just referred overseas as a Japanese actor, there was also “from the pop idol group Arashi” always attached to his name. It’s like a mirror: one’s individual success reflects back on the rest of the group. Don’t they say themselves in numerous occasions that their solo work is not only their own but Arashi’s? 8. Arashi Around Asia. Thanks mostly to HYD, overseas fans became aware of the existence of a Japanese group called Arashi. Their albums became available outside Japan and this prompted their management to bring them over for concerts. In connection with this, they had the Arashi Jet Storm Tour, where they went to Taipei, Bangkok and Seoul in one day aboard the Arashi Jet to promote the tour. Too bad the Bangkok concert never pushed through because of a coup d’etat (and I have never forgiven the Thai military for that). They have performed in Seoul, Taipei and Shanghai since. And I know I’m not the only one wishing for another AAA. 9. Asia Song Festival 2006. Considering the stormy (no pun intended) relations between Japan and South Korea, it has been very rare even to this day for Japanese artists to cross the Sea of Japan and perform in its neighboring country (it ain’t the same vice versa though because K-pop stars flock to Japan for, let’s face it, the moolah; Japan being the largest music market in the world). But in 2006, Arashi did it, performing on the invitation of the Korea-based festival as Japan’s representatives. If for anything, it was a gauge of how popular they have become. My behind-the-story on this here. 10. First Kokuritsu concert (2008). They became the only third musical group to perform at the National Olympic Stadium (otherwise known as Kokuritsu), and in 2009, became the first artist to perform at the 70,000-venue for three consecutive nights. This year will be their sixth consecutive year that they’ll be giving sold-out concerts in Kokuritsu. This year’s Arafes will also serve as some sort of a farewell to Kokuritsu before it is closed down for renovations ahead of the Tokyo Olympics in 2020. I’m sure it will be an emotional time for the fans and Arashi. 11. Japan Gold Disc Awards 2010. They were the first artist to win in TEN categories including Artist of the Year. The others were: Album of the Year (All the BEST! 1999-2009), Single of the Year (Believe), 5 Best Singles (Ashita no Kioku/Crazy Moon～Kimi wa Muteki; Everything; Believe; My Girl) and Best DVD domestic (ARASHI AROUND ASIA 2008 in TOKYO and 5×10 All the BEST! CLIPS 1999-2009). All these while celebrating their 10th year. 12. Tokyo Tower Arashified (2012). Which idol group or artist can claim that Tokyo’s favorite and famous landmark was lighted in their honor? 13. 24 HOUR TV (2004, 2008, 2012, 2013). They hosted it for the fourth time this year as the “main personalities”, setting a record for being the first artists to do so for the second consecutive year. 14. Kohaku (2009, 2010, 2012, 2013). Arashi will be hosting the iconic year-end by-invitation only musical special on NHK for the fourth consecutive year. If rumors are to be believed, they are tied to a five-year contract to host this show. They appeared on the show for the first time in 2009 as one of the performers. As there are only 14 slots for the milestones, I’m sure I have missed out on a lot of other equally important moments in Arashi’s career, including the 5×10 song they composed for the fans on their 10th anniversary and which defines their relationship with the people who have supported them all these years. For additional reference, my 5×13 post last year on my 13 favorite things about Arashi. Arashi, thank you for saving lives and making the world a happier place. It’s no exaggeration to say that you are one of the reasons why I am able to face each day with renewed vigor and faith. I wish you good health, good fortune and happiness. Hontou ni, hontou ni… arigatou gozaimasu! Thanks for the heads up! I checked her blog and found a link back to this post so all is well. I’m not asking for anything but proper credit, ‘s all. Thanks again! No prob. I read this post in your blog first before I came across her post. I don’t have tumblr though so I don’t know how the link back works. I didn’t see any credit so I thought it might be another case of re-posting w/o credit. Apology to touchthefrog too for the misunderstanding. i read ur past blog entry and humor me pls. ive seen them in person too and let me know if u were as surprised as me at how they look in person…i mean holy hell, people often say that aiba and ohno looked least attractive but when i saw them, dang aiba looked FINE and dont get me started at how adorable ohno looked. hi, for some reason your comment went to my spam folder. good thing I saw it! so sorry about that. Hmmm I’m not sure if I was surprised at how they looked in person. I’d say most of these celebrities look bigger than life in real life if you know what I mean. I didn’t get to really notice Ohno and Nino coz they had their backs turned. and it’s different onstage with the lights and all. Aiba looked like a cute little boy, I like his eyes though they’re different from Jun’s. Jun is so beautiful. Sho at that time was in his Aozora Pedaru kind of phase so he looks different now but he was the nicest among all of them.